﻿JUAN PERON and ARGENTINA A study of Argentine History from 1946 - 1955 Monday, May 28, 2012 Word Count: 2022 TABLE OF CONTENTS Plan of Investigation ............................................................................. 1 Summary of Evidence ........................................................................... 2 Evaluation of Sources ........................................................................... 5 Analysis ................................................................................................. 6 Conclusion ............................................................................................ 8 Bibliography........................................................................................ 10 Part A: Plan of Investigation Under Juan Domingo Peron, the years 1946-1955 underwent many and frequent permutations in the political and social sectors of Argentina. 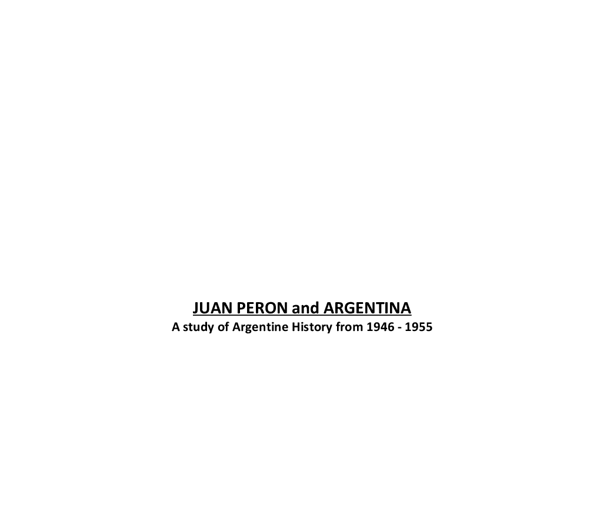 This essay will attempt to answer the question, ?Evaluate the success of Juan Peron in personalizing power in the political and social sectors of Argentina from 1946 ? 1955.? The two main sources that will be assessed for their OPVL are Politics and Education in Argentina, 1946 ? 1962, by Monica Esti Rein and The History of Argentina by Daniel K. Lewis. This investigation will only focus on Juan Peron?s efforts to ?Peronize? the Argentine government and educational system. However, it will not assess Juan Peron?s attempts to ?Peronize? other social policies, nor will it assess his role in the economic sector during his tenure. In addition, references to Peron?s rise to power or fall from power will be limited. ...read more. In addition, its clear and concise language and style make it an easy ? read and particularly suitable for undergraduate courses, as well as ?specialists concerned with education in Latin America, comparative educators and educational historians in general, including anyone interested in better understanding the role of the school in social and ideological reproduction.? This book, as such, has no limitations as it is very informative on the subject and provides in-depth analysis. Greenwood Press published The History of Argentina by Daniel K. Lewis in 2001. The purpose of this book was ?to provide a brief overview of Argentina?s complicated history.? This up-to-date and accurate history of Argentina provides a solid and engaging introduction to the persons, events, and factors that have helped shape the nation. 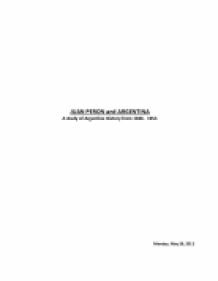 This book covers the entire history of Argentina from pre-Columbian times to 2001, outlines the connections between the colonial era and the 19th century and focuses closely on the last three decades of the 20th century, during which Argentina dealt with the legacies of Peronism and of military dictatorship. Also included is a timeline of historic events in Argentina, biographical sketches of key people in its history, a glossary of terms, and a bibliographic essay of works in English for further study, making it a valuable source. ...read more. and obedient, accepting what others decided for him, and not a sharp, thinking intellectual, curious and critical, and always looking for alternatives.”  Part E: Conclusion Juan Peron was successful in personalizing power through the reorganization of the government and the education system. He met resistance to the opposition with force by arresting the members of the parliament that expressed anti – Peronism as well as limiting them from the access to the media. Furthermore, he aimed to reorganize the education system because, as Peron stated in a speech, "we have been fighting for five years now so that this just, free, and sovereign New Argentina might grow, ... but we know that the future is in the hands and the souls of children and young people...." This being so, Perón believed that time and special attention should be devoted to them, thus resulting in his best attempts to increase the number of schools and the number of children attending these schools. As a result, with the increase in the enrollment of the children, Peron was effectively able to indoctrinate the children and disseminate the beliefs of Peronism. In conclusion, Peron efficiently instilled the Peronist ideology into the Argentines and was successful in peronizing Argentina during his presidency. ...read more. more comfortable, letting them move easier and giving them a nice breeze, which made a great deal of importance because they live in a desert. The Abyssinian invasion led to diplomatic ties, breaking his links with Britain and France and seeking ever closer relations with Nazi Germany. * Mussolini made a military alliance with Germany and this support is one factor that gave Hitler the growing confidence to challenge Britain and France and revise the Versailles treaty's territorial settlement in the East. ley agraria que reconoce la propiedad de los pueblos y se crea la Comisi�n Nacional Agraria. Y con esta comisi�n se establecen agrupaciones obreras y se siguen sacando leyes que mejoren la situaci�n. Y por ejemplo hubo huelgas apoyadas por la COM. When Vargas left the "New State" ended. Even with Vargas being overthrown he still remained widely supported by Brazilians. When Vargas ran for president again in 1950, He ran on the platform of populism induced military, elite, and United States fear of nationalism. Derevolutionize the peasantry by removing most glaring grievances 3. Restored order and crushed opposition after 1905 and introduced some reforming measures which led to the relative stability up to 1914. Shapiro ?By the left?dismissed as a savage butcher who hanged peasants and workers?extreme right?reform and attempt to work with the Duma were a threat to autocracy. The people inside the Party started to question if Mussolini was the best person to dictate. Later in 1925 Mussolini gave a public speech in which he said, ?Italy wants peace and quiet, work and calm. I will give these things with love if possible and with force if necessary.? Which of indoctrination and repression proved most effective for consolidating Hitler's power (1933-1939)? Goebbels introduced the mass rallies (Nuremberg annual rallies). The results of this propaganda varied. Although the sales of books increased, the quality of the artistic production is to be questioned, as the plays that were tolerated by the Nazis were musical and tend to prone the nazi politics, those plays didn?t have much success.